South facade of the Park Grove Club Residences (center) and Two Park Grove (right), with the site of One Park Grove in the foreground. Work is underway on Park Grove, the three tower development from OMA in the Coconut Grove neighborhood of Miami. One million square feet of residential units is distributed across three luxury residential towers on 5.2 acres across from Regatta Park. Exterior construction on the first two towers, the Park Grove Club Residences and Two Park Grove are nearing completion, with work set to begin on One Park Grove, the third and final tower. Site of One Park Grove with the Park Grove Club Residences (center left) and Two Park Grove (center right) in the background. 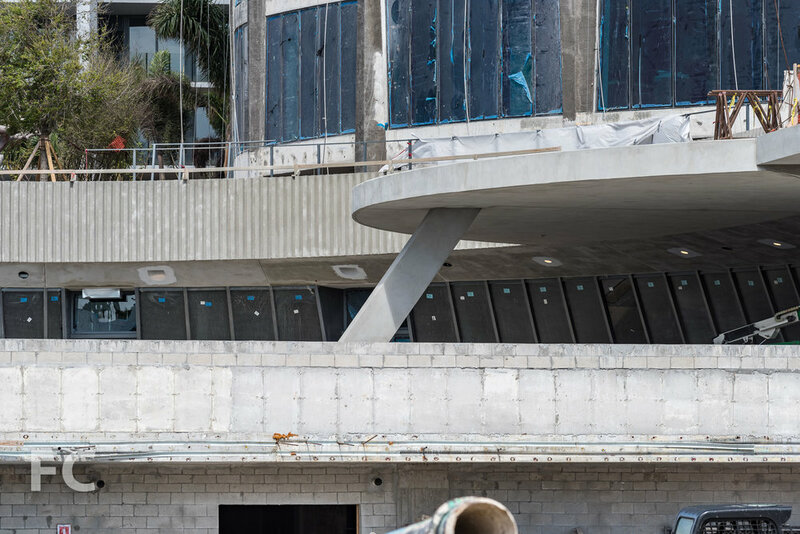 Each of the towers feature an asymmetrical, cylindrical massing with curved floor plates that optimizes views of the Biscayne Bay and reduces wind loads on the facade. Perimeter columns feature a tapering profile and are located to address privacy concerns between towers. CLose-up of the podium at Two Park Grove. The Park Grove Club Residences (left) and Two Park Grove (right) from . Close-up of the facade of Two Park Grove. Close-up of the facade of the Park Grove Club Residences. Looking up at the north facade of the Park Grove Club Residences. South facade of the Park Grove Club Residences (center) and Two Park Grove (right). Close-up of the top floors of Two Park Grove. Park Grove (center) and the Grove at Grand Bay (right) from Regatta Park. Architect: Office for Metropolitan Architecture (OMA); Developers: Terra Group with Related Group; Interiors: Meyer Davis; Landscapes: Enzo Enea; Program: Residential; Location: Coconut Grove, Miami, Florida; Completion: 2020.